I am a Type 1 diabetic. And yes, I can eat that. I am a diabetic, diagnosed at the age of two. I have come to the conclusion that diabetes is a part of who I am and always will be. But, as I watch my favourite sitcom on television and hear “it tastes like diabetes!” or when I enter the checkout aisle at the grocery store and read magazine headings promising to ‘reverse’ diabetes, I become infuriated with the generalization of my chronic illness. It is coming to the point where diabetes is synonymously paired with poor health choices. As political parties remind us of the burdening cost of our healthcare system and social media groups discuss the obesity epidemic and the rapid increase of individuals being diagnosed with diabetes, a great opportunity has been created to bring attention to this debilitating disease. Hopefully, this attention will lead to prevention and better treatment, and even a cure. Although the increasing cost of diabetes to individuals, families and governments is a serious reality in Canada, some communications are detrimental to the true understanding Type 1 diabetes. In daily conversation I am reminded of the lack of understanding of the general public regarding what Type 1 Diabetes is and how it affects the individual living with it. I do believe that the only way to truly understand the effects of this hidden, chronic illness is through experience. I figured I would highlight some of these misconceptions and myths. 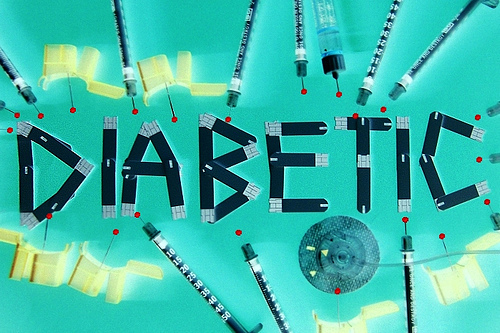 There are three main types of diabetes: Type 1, Type 2, and Gestational Diabetes. •	Type 2 Diabetes occurs when the pancreas does not produce enough insulin, or when the body does not effectively use the insulin it produces. It is usually diagnosed in adulthood, but an increasing numbers of youths with obesity are establishing a high-risk population. •	Gestational Diabetes is a temporary condition that occurs during pregnancy. In this case it is possible but unlikely that their grandpa has T1 diabetes, as 90% of the diabetic population has Type 2 Diabetes (especially if they are diagnosed after the age of 40). Although a balanced diet is needed to effectively manage all types of diabetes, Type 2 diabetes is usually controlled through both physical activity and meal planning. Although T1 diabetes usually occurs before the age of 30, an individual can be diagnosed at anytime in their life. That is why it is no longer called “juvenile”; you do not need to be a child to be diagnosed. Your body gets energy from foods producing glucose (sugar). To use this energy your body needs insulin to control glucose levels. Individuals with T1 diabetes cannot produce insulin on their own. To control their glucose levels they can administer insulin with a syringe, pen or pump. They pay close attention to nutrition labels through carbohydrate counting and combat the glucose with insulin. Yes, I can eat that. As long as I administer the right amount of insulin needed for the food I am consuming; I can safely eat any type of food. Monitoring your sugar intake is something everyone should be aware of to ensure a balanced diet, not just those with T1 diabetes. T1 diabetes is not caused by an unhealthy diet, however a healthy diet is necessary to maintain controlled sugar levels. Monitoring your blood sugar levels is a mandatory requirement for a T1 diabetic. Having too high or too low blood sugar levels can be very dangerous. Diabetics try to manage their blood sugars within a target range (mine is between 4.5-7 mmol/L). •	When your blood sugar levels are too high it is called hyperglycemia. Symptoms include but are not limited to; blurred vision, decreased mental sharpness, extreme thirst/hunger, fatigue, frequent need to urinate, fruity smelling breath, nausea, increase heartbeat, pain in the abdomen, confusion, loss of coordination. •	People often associate large amounts of sugar with being hyper. When I have high blood sugar it feels more like the flu appose to extreme excitement. •	High blood sugar can be brought on my taking too little insulin, eating too much food/not calculating food measurements properly, during stressful times, or illness. If left untreated it can cause life-threatening complications. •	When your blood sugar levels are too low it is called hypoglycemia. Symptoms include but are not limited to; cold sweats, fast heartbeat, hunger, lightheadedness, numbness of the tongue and lips, shakiness, anxiety, nausea, confusion, blurred/or no vision, loss of coordination, extreme weakness. •	Having low blood sugar is similar to the feeling of being extremely intoxicated. •	Low blood sugar can be brought on by taking too much insulin, missing a meal, or over excursion or exercise. If left untreated it can cause life-threatening complications. Individuals without diabetes produce insulin on their own through their pancreas, an individual with diabetes administers the intake of insulin. Before insulin was discovered T1 diabetics would die of malnourishment or hyperglycemic induced comas. I will not be ‘cured’ of T1 diabetes until my body can produce insulin on its own. Synthetic insulin is a treatment, not a cure. To manage their overall health T1 diabetics must check their glucose regularly (poking their fingers for small amounts of blood) to keep their blood sugars in target range. They must also take insulin through needles or a pump to survive. I don’t think anyone enjoys poking and prodding at himself or herself multiple times a day. For an individual with T1 diabetes this is not optional. The cause of T1 diabetes is unknown. However, it is not preventable, and is not caused by eating too much sugar. It is believed that there is an environmental factor that causes the body’s defense system to attack insulin-making cells. There is also a hereditary component. Since there is no cure for T1 diabetes, once diagnosed you are a lifetime member. This is so great to see! I am so sick of people like Alec Baldwin saying he can’t eat sugar because of his T2 pre-diabetes. Clearly, he should be saying he has to count his carbs. Even some people in the medical community don’t seem up to date with awareness that people with diabetes need to eat a regularly balanced diet, just like everyone else. I also find the flu commercials offensive where they portray needles as very scarey. When you have diabetes this is not an option, and the media should be more sensitive to this. My daughter was diagnosed with Type 1 this week. We are healthy with no history of diabetes in your family. This is a shock to us but we’re learning how to deal with it. As far as what the village idiots in Hollywood think, I could care less. My skin is thick, all I care about is my daughter in her future. Stop taking selfies of yourself and take care of yourself. Hi Jon — Thanks for your comment and glad you found us! Sending support to your family and your daughter as you go through this difficult transition period.